Clinical Findings: 75 year old diabetic patient with recurrent ulceration to the right third metatarsal bone after infection related surgical removal of second toe and second metatarsal. Increased pressure noted to the third metatarsal bone noted without orthotic therapy. 43% reduction in peak pressure with orthotic use on the right third metatarsal. Recommendations: Diabetic shoe with orthotic with external rocker sole on shoe to decrease forefoot pressures. 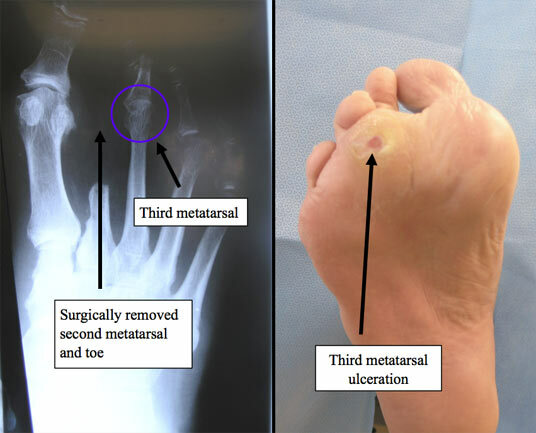 This is a clinical picture of the recurrent ulceration on the bottom surface of the third metatarsal bone related to elevated foot pressures. The x-ray picture on the left shows the surgically removed second metatarsal and toe. Dynamic weight bearing pressures on the foot exceeding 40PSI have been associated with a greater risk of ulcer development. 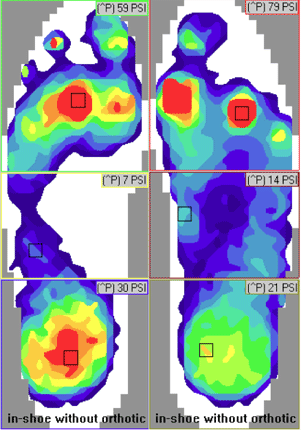 The goal with shoe and orthotic therapy is to reduce PSI readings to as close to 40PSI or below. Please complete this form prior to your FSCAN Screening visit.